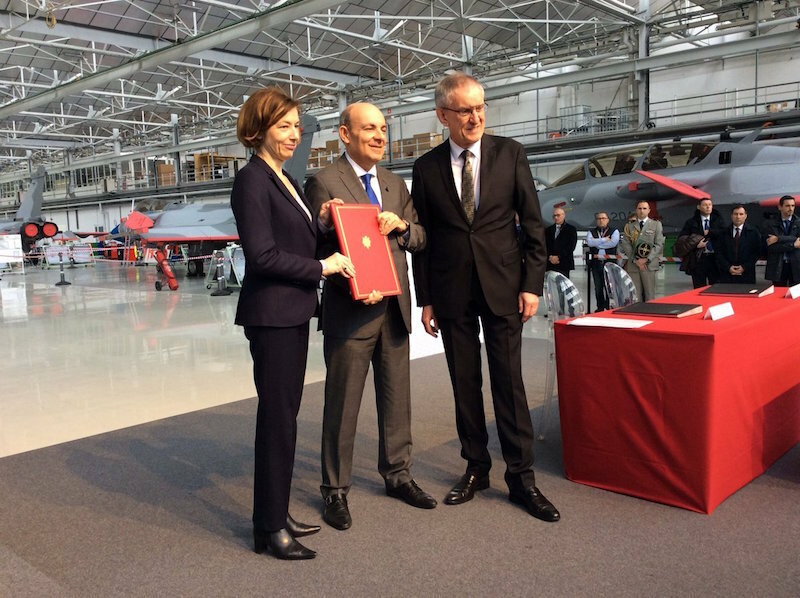 MÉRIGNAC, France --- Eric Trappier, Chairman and CEO of Dassault Aviation, received the F4-standard development contract for the Rafale combat aircraft today during the visit of the Dassault Aviation Mérignac plant by Florence Parly, French Minister of the Armed Forces. New functions will also be developed to improve the aircraft's capabilities (upgrades to the radar sensors and front sector optronics, helmet-mounted display capabilities), and new weapons will be integrated (Mica NG air-to-air missile and 1,000-kg AASM Air-to-Ground Modular Weapon). Lastly, with regard to availability, we are working under a through-life support contract which will become more "top-down" under the authority of the aircraft manufacturer. F4 will include a new Prognosis and Diagnostic Aid System introducing predictive maintenance capabilities. Other maintenance optimization features are scheduled, particularly with solutions based on Big Data and artificial intelligence. Lastly, the Rafale will be equipped with a new engine control unit. "The F4 standard guarantees that Rafale will remain at world-class level so that our combat air forces can carry out all their missions with optimum efficiency, whether in coalition operations or completely independently, as required by the French nuclear deterrent,” stated Eric Trappier. “This new standard also guarantees that Rafale will remain a credible reference on the export market. Lastly, it confirms the continuous improvement approach and helps develop the manufacturers' skills." -- Interception and air-to-air combat using a 30-mm gun, Mica IR/EM missiles and Meteor missiles. -- Close air support using a 30-mm gun, GBU laser-guided bombs and AASM GPS-guided bombs. -- Deep strike using Scalp-Storm Shadow cruise missiles. -- Maritime strike using the Exocet AM39 Block 2 missile and other air-to-surface weapons. -- Real-time tactical and strategic reconnaissance using the Areos pod. -- Nuclear deterrence using the ASMP-A missile. The Rafale entered service with the French Navy in 2004 and with the French Air Force in 2006, gradually replacing the seven types of previous-generation combat aircraft. It has proven itself in external operations in various theatres: Afghanistan, Libya, Mali, Iraq and Syria. 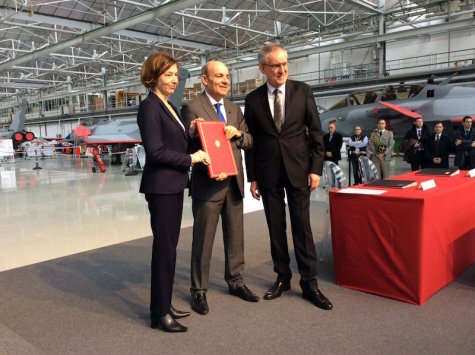 Of the 180 aircraft ordered by France to date, 152 have been delivered. The Rafale fleet currently totals almost 270,000 flight hours, including 40,000 in operations. A total of 96 Rafale aircraft have been ordered by Egypt, Qatar and India. (EDITOR’S NOTE/ Although this is not mentioned in Dassault’s announcement, the F4 contract is valued at about 2 billion euros. While this contract does not include any aircraft production, the final 30 Rafales – due to be ordered in 2023 for delivery in 2027-2030 -- will be delivered in this F4 version. All Rafales in French service will be gradually upgraded to the same F4 standard.